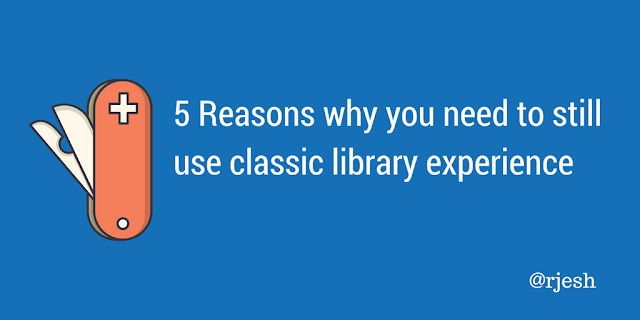 Here are my five points why I use the classic library experience even in a modern team site, or the site provisioned with office 365 groups. All the time we were evangelizing the use of the meta data and tagging the documents, in the modern experience the required fields are not mandatory. Check-in form is not shown to the user after the document is uploaded, so its user's discretion to use information panel to enter the required fields. Also the document is not marked in any way to notify the user that its missing required column or content type. In the classic library UI, the document would be checked out and could only be checked in once the user filled in the required metadata. Users are not prompted to select a content type when the document is uploaded, when the library is associated with two or more content types. Uploaded documents are assigned with default content type, again user has to explicitly open the information details panel and change the content type and fill-in the associated meta data. Real confusion starts when you have retention policy defined with declare record stage. In the modern experience all the records are shown as checked out item, you won't know which one are draft checked out documents and which ones are marked as records. In the modern experience when you click on the document set, it takes you back to the classic experience old UI in a very disjointed experience. Cast your vote here in user voice to add modern experience to document sets. Metadata navigation and filtering – All libraries on sites that have this feature enabled are shown in classic view. I'm not getting deeper in to the ribbon buttons and various other features like Export to Excel, Popularity trends, and other custom actions. Above is not the complete list, I tried to list out some key features which are not part of the modern experience. As of now there is no workaround other than using classic view, until the feature has been rolled out by Microsoft. If you are using Office 365 group site or Modern team site then you might need to go the library settings and set the experience to classic, in case if you are planning to use any of the above features. Modern experience has many new and enhanced features, so we cannot totally rule out and go for classic view, its to be decided case to case based on the needs of the site.